Last year Rafael Nadal became just the third man in the Open era to win the Western & Southern Open, the Rogers Cup and the US Open in the same year. Rafael Nadal clinched the 2013 Emirates Airline US Open Series men’s title on Monday when John Isner officially withdrew from the Winston-Salem Open in Winston-Salem, N.C., due to a hip injury. Isner was the only player who could have overtaken Nadal in the Emirates Airline US Open Series Bonus Challenge standings. Nadal will now compete for the largest payout in tennis history at the 2013 US Open – $3.6 million ($2.6 million for winning the US Open and a $1 million bonus for winning the US Open as the Emirates Airline US Open Series champion). Nadal totaled 200 points in this year’s Emirates Airline US Open Series, capturing singles titles at both the Rogers Cup in Montreal and at the Western & Southern Open in Cincinnati, where he narrowly defeated Isner in the final, 7-6(8), 7-6(3). 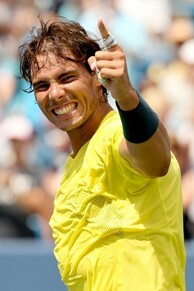 Nadal, the 2010 US Open champion, also won the Emirates Airline US Open Series in 2008 – taking home $250,000 in bonus prize money for reaching the semifinals at that year’s US Open – and joins Andy Roddick (2005-06) as the only men’s players to win two Emirates Airline US Open Series titles in the Series’ 10-year history. Isner, with 185 points, finishes second in the Emirates Airline US Open Series for the second straight year and will play for a chance at $500,000 bonus prize money at the US Open. Juan Martin del Potro finishes third and can win up to $250,000 in bonus prize money at the US Open. Serena Williams clinched the 2013 Emirates Airline US Open Series women’s title on Saturday by defeating China’s Li Na in the semifinals of the Western & Southern Open. Williams will also compete for a record $3.6 million payout at the US Open. The second- and third-place finishers on the men’s and women’s sides will compete for $500,000 and $250,000 bonus prize money, respectively. The women’s second- and third-place finishers have yet to be determined. The Emirates Airline US Open Series Bonus Challenge has resulted in some of the largest paychecks in tennis history for men ($2.4 million for Roger Federer in 2007) and women ($2.2 million for Kim Clijsters in 2005 and 2010). Now in its 10th season, the Emirates Airline US Open Series continues to serve as a true regular season of hard-court tennis, linking nine summer tournaments to the US Open. More than 200 of the game’s top players are competing during the Series for more than $50 million in prize money. Additionally, through the Emirates Airline US Open Series Bonus Challenge, the USTA will offer up to an additional $2.6 million in bonus prize money at the US Open to the top three men’s and top three women’s singles finishers in the Emirates Airline US Open Series.